It looks like another leg up for the Vancouver condo market. Last week I mentioned condo sales were 22% above the 10 year average in May. Couple this with the fact inventory is down 18% year over year and it’s a recipe for disaster. First time buyers are rushing into the market, and in an attempt to keep up with prices are having to get creative with financing, including help from Mom and Dad. Free money from the BC Government has only made matters worse, the program has now approved an additional 327 first timers in Metro Vancouver. 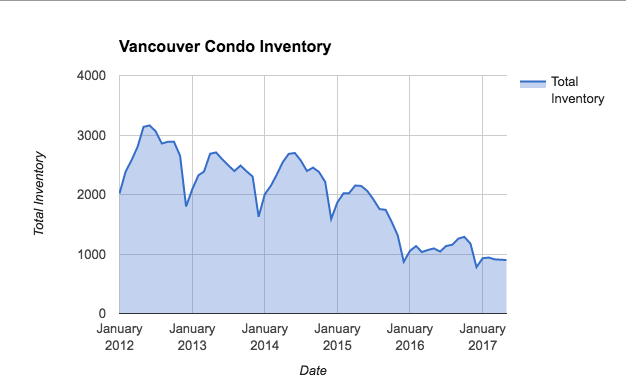 It appears official, Vancouver condos have lost all price discovery. Buyers are paying any price imaginable in order to secure a piece of the pie. Previous sale comparisons seem virtually irrelevant. Multiple offers are now expected on any unit below $1 million. A competitive frenzy that makes last year look tame, is pushing prices to all time highs. 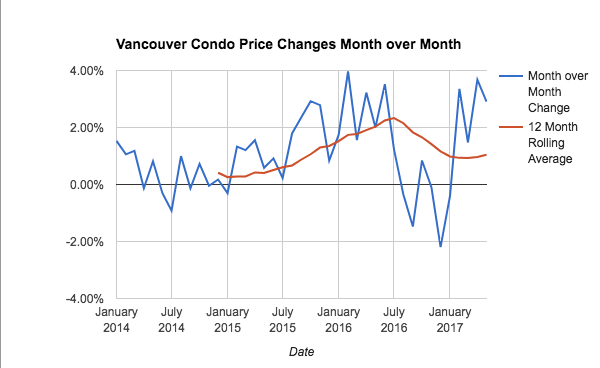 Vancouver condo prices are currently increasing at a rate of 2.2% per month since January, 2017. Well ahead of the 12 month rolling average of 1% per month. Vancouver Condo prices growing 2.2% per month in 2017. It appears onwards and upwards… For now.